All steel construction. Riveted bracket for added structural strength and featuring flared nail holes for quick and easy disassembling. For use with standard 2x4's. Black enamel finish. Turns standard 3-1/2 - 5 gallon buckets into comfortable seat. Grooved design channels away moisture. Durable lightweight plastic. Newly redesigned and engineered to satisfy virtually any storage need. Top organizers enable small parts organization. Latch with geometric lock for smooth and easy use. New elegant design with sturdy robust appeal. Pad eye lock, enables to lock the toolbox. Top recesses for screws and washers. Tool tray with handle and enabled side access for flexible storage solutions. Two lid organizers for small parts storage - accessible without opening the tool box; built-in pad lock eye for small locks - keeps contents secure; soft, wide rubber coated handle allows for easy and comfortable grip; nickel metal-plated latches; tote tray inside to store smaller items. Newly redesigned and engineered to satisfy virtually any storage need. Top organizers enable small parts organization. Latch with geometric lock for smooth and easy use. New elegant design with sturdy robust appeal. Pad eye lock, enables to lock the toolbox. Top recesses for screws and washers. Tool tray with handle and enabled side access for flexible storage solutions. Organize a wide range of tools and accessories, 14 double row pockets inside, 34 triple row outside. Security pocket with hook, loop closure. Drill pocket. Features removable dividers for inner customization; carry handle for easy portability; unique lid design keeps small parts from moving between compartments. Heavy duty transparent polycarbonate lid and side latches enable stacking to other PRO organizers. 6 large compartments for organizing and stowing small parts. 6 pockets outside and 6 for inside for a variety of tools and accessories. Easy-lock/pushbutton-release drawstring system. Soft bottom panel prevents tipping and spilling. 10" Diameter x 7" High. One hand operation latch allows opening when other hand is occupied; innovative design with robust structure and large volume; extra-wide soft grip handle for easy lifting; removable tray allows enough space for larger tools to be stored underneath; organizers on top lid for small parts organization. Made of 600 poly ripstop fabric. Fits most 5 gallon buckets. 3 interior loops for hammers, drills, pry bars and other long tools. Inside is left open for remaining tools. Flexible platform allows different combinations; Bi-material handle on top of each unit for easy and comfortable lifting; all units can stack on top of the other, connected with durable side latches; heavy-duty metal latches for rust resistance. Made of durable rugged, polyester fabric. 36 triple row outside pockets, 25 double row inside pockets. Drill holder with side release buckle security strap. Designed to fit most standard 3-1/2 to 5 gallon buckets. 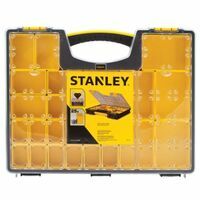 One hand operation latch allows opening when other hand is occupied; innovative design with robust structure and large volume; extra-wide soft grip handle for easy lifting; removable tray allows enough space for larger tools to be stored underneath; organizers on top lid for small parts organization. Lightweight, durable, rust proof, plastic construction; telescopic aluminum handle; convenient and compact; folds down flat for storage; 80 lb loading capacity. Flexible platform allows different combinations; all units can stack on top of the other, connected with durable slide latches; removable covered cups for organization of small parts and accessories; removable dividers for organization of drills and bits; ball bearing slides reliable for heavy-duty loads; bi-material handle on top of each unit for easy and comfortable lifting; heavy-duty metal latches for rust resistance. M-D Folding Sawhorse, Heavy Duty, Steel, M-D, 1500 lb Load Capacity, 28-1/2 in Height, 31 in Width, Galvanized Flexible platform allows different combinations; all units can stack one on top of the other and connects with durable side latches; built in bi-material handle for easy and stable portability; removable tray for quick access to tools that are most used; extra large volume for high tools storage. 22 pound load capacity; side katches allow connectivity for easy carrying and safe stacking; removable compartments for small parts and accessories and once removed for power tool and charger; clear and impact resistant unique lid design locks all compartments in place; full visibility for quick access; built-in wide handle for easy and stable portability and metal hinges and latches. Great for laundry, groceries, sport, school and much more; folds flat to 3" thick; push button telescopic handle; 4 wheel operation; stores any where; smooth rolling; 55 lb capacity; handle extends to 39.5". Holds 800 pounds per pair; lightweight, easy to transport; integral V-groove; tray opens up to hold your tools. 150 pound capacity hand truck folds down to 2" thick for easy storage; sturdy steel frame with an extra load support plate; integrated single hand lock and release handle with strong composite supports for a wobble free performance; bungee cord included, hand truck is equipped bungee knobs and pre-drilled bungee support holes. Dimensions: 40" H x 15.25" W, 5" wheels. Constructed with impact resistant materials for jobsite durability and features an IP65 rated weather seal to keep out rain and jobsite debris. Holds up to 500 lbs (Total weight when using BOTH sawhorses); non-slip feet; flip-up edge guides; non-slip rests; fold to less than 2" for easy storage. Dimensions: H-33.07" x L-23.03" x W-16.14". Part of the "ToughSystem" line - can also be stacked with other "ToughSystem" modules; durable, thick structural foam walls; large open interior for bulk storage; internal slots for inserting dividers for organization of space. Heavy-duty weather & dent resistant aluminum construction. Reinforced frame and corners for added strength. Padded dividers and removable 17 pocket tool holder. Applications: Ideal for tools, hobbies and crafts, cameras and more. 2 Keyed Locks for security. Tough material combination and embossed logo branding; tough resin combined with gray metal and long lasting branding; tall tool box with a vertical storage unit for organization and easy access; long metal hinge to carry the heavy loads; large metal latches, heavy-duty, strong, rustproof; portable tray for hand tools and small parts; holes ready for inserting a lock for security of your tools; V-groove on top lid for any onsite sawing and adjusting needs. 22 exterior pockets, 12 interior pockets, hammer loop, tape holder loop, padded shoulder strap, side clips secure the organizer and reflective material. Easy to fold-up and carry with one hand; plastic sawhorse with metal legs; capacity load of 750lbs (340 kg) per pair of sawhorses. Dimensions: 12-12" H x 101" L x 75" W. Adjustable leg folding sawhorse with five variable height adjustments. Yellow powder coating finish. Work surface thickness 0.079" (2mm) 14 gauge, leg thickness 0.067" (1.7mm) 15 gauge. Open range size, 38-1/4" W x 25-1/2", 40" H, folding size, 38-1/4" L x4'' W x 2-3/4" H, load capacity, 1200 Lbs, steel carrying handle. Innovative design with robust structure and large volume; telescopic handle for convenient maneuverability and folds down for storage; removable tray allows enough space for larger tools to be stored underneath. Extra heavy-duty, professional; water seal makes toolbox water resistant; ideal for carrying power tools, hand tools and medium to large items; portable half tray allows room for storage or larger items; V-groove with ruler on top of lid holds materials such as lumber and pipes in place for cutting. Holds 1000 lbs per pair; light weight - easy to transport; integral V groove and tray opens up to hold your tools. Durable tool box with integrated organizer for small parts and connectors; extra wide carrying handle makes it easy to transport the box around the jobsite; heavy duty resin design stands up to the toughest daily abuse; top organizer detaches from tool box for added versatility; corrosion resistant latches keep your valuable tools safe and secure in the box; perfect storage solution for mechanics, electricians, maintenance workers, etc. DeWalt Water Seal Tool Box, Lockable, 2125.2 cu-in, 28 in Width, 100 lb Load Capacity, Latch Locking, Ergonomic Handle, Metal Latch, Black, 7.1 in Handle Length, For Storing and Transporting Your Tools on the Job Site Flexible platform allows different combinations; all units can stack on top of the other, connected with durable slide latches; removable covered cups for organization of small parts and accessories; removable dividers for organization of drills and bits; ball bearing slides reliable for heavy-duty loads; bi-material handle on top of each unit for easy and comfortable lifting; heavy-duty metal latches for rust resistance. Each leg adjusts separately, allowing the sawhorse to stand on uneven surfaces; rubber inserts for stability; high-quality, sturdy polypropylene and steel legs; unique slide mechanism, providing for easy, smooth adjustment. Features durable and thick structural foam walls, integrated water seal and rust-resistant metal latches. Storage pockets on the lid and 4 removable cups allow for storing small parts and side latches allow the product to be stacked to the other modules of the "ToughSystem" storage line. Clear lid made of polycarbonate for resistance and full content visibility; includes 4 large and 8 small removable cups; stacking side latches allow attaching additional organizers or other "ToughSystem" modules; fits "ToughSystem" Metal Carrier DWST08210 and can be secured by its central locking mechanism; durable structural foam box walls give robust structure; integrated water seal for protection from the environment (IP65); robust anti-rust metal latches. Push button telescopic and lightweight aluminum design; smooth rolling 2 wheel design; stores anywhere - even cramped spaces for the ultimate storage convenience; ergonomic grip and fold away handle; 155 lb load capacity. Constructed with impact resistant materials for jobsite durability and features an IP65 rated weather seal to keep out rain and jobsite debris. The interior features 10 removable bins that can be mounted onto common jobsite materials for easy access and no-travel bins seals to prevent the bins contents from migrating between bins during transport. Durable 4mm thick structural foam box wall gives robust structure to the stand alone units; integrated water seal in every unit for protection of contents and long life for your equipment; metal carrier with adjustable foldable brackets allows tailored configuration; central locking mechanism secures the box to the frame; IP65 rating - water and dust resistant. For use with the dewalt "TSTAK" system; 4 heavy duty wheels; for transporting tools and stored items around the worksite. Durable 4mm thick structural foam box wall gives robust structure to the stand alone units; integrated water seal in every unit for protection of contents and long life for your equipment; metal carrier with adjustable foldable brackets allows tailored configuration; central locking mechanism secures the box to the frame; IP65 rating - water and dust resistant. Lightweight yet sturdy, the collapsible tabletop design offers maximum versatility and portability. Folds in half for easy storage and out-of-the-way storage. Metal leg stand won't slip on hard surfaces or sink in soft ground. Sets up in seconds and securely supports up to 300 lbs. Perfect for any project or event, indoors or out. Durable 4mm thick structural foam box wall gives robust structure to the stand alone units; integrated water seal in every unit for protection of contents and long life for your equipment; metal carrier with adjustable foldable brackets allows tailored configuration; central locking mechanism secures the box to the frame; IP65 rating - water and dust resistant. Removable dividers to customize compartment sizes. Advanced One-Handed Clamp system with exclusive clutch design for easy clamping. Advanced clutch design allows for fine-tuning. Folds for easy storage. Steel construction holds up to 450 pounds. Dual height for use as a workbench, bench tool stand, vise or sawhorse. Standard Equipment - Four Swivel Pegs. Specialized One-Handed Clamp handle. Rubber feet. SPECIFICATIONS: Bench Height 30-1/8". Parallel Clamping 0 - 9-1/4", Parallel Peg Clamping 0 - 16", Diagonal Peg Clamping 0 - 24". Work Surface 9-11/16" x 24". Holds 1000 lb. per pair (800 lb. extended); 2 way adjustable; smooth slide mechanism for width adjustment; anti-slip rubber on feet and top of safety; innovative ergonomic mechanism for height adjustment; the new height adjustment mechanism enables to adjust the height in open or folded position. Constructed with impact resistant polymers and metal reinforced corners to provide up to 100lbs of weight capacity and ultimate durability in harsh jobsite conditions. Featuring an IP65 rated weather seal to keep out rain and jobsite debris and a metal reinforced top handle. The Milwaukee PACKOUT? tool box is fully compatible with all Milwaukee PACKOUT? modular storage products. Strong and tough; simple design for fast, easy set up; make sawhorse whatever length you want by using any 2X lumber; Lifetime Guarantee. Constructed with impact resistant polymers and metal reinforced corners to provide up to 100lbs of weight capacity and ultimate durability in harsh jobsite conditions. Featuring an IP65 rated weather seal to keep out rain and jobsite debris and a metal reinforced top handle. The Milwaukee PACKOUT? tool box is fully compatible with all Milwaukee PACKOUT? modular storage products. Collapses to 8" wide for easy storage; securely locks open and closed; 3 levels for holding items; handles feature dual comfort material and 3" swivel wheels with a sleek modern design; constructed of durable, lightweight aluminum with 3" rubber swivel wheels; max load 50 lbs per level; open dimensions: 34" x 15" x 26-1/8"; closed dimensions: 42" x 15" x 8". Do not stand on or ride on; keep hands clear when folding shut; follow maximum weight instructions and do not overload. Advanced One-Handed Clamp system with exclusive clutch design for easy clamping. Front jaw swings up for vertical clamping. Folds for easy storage. Steel construction holds up to 550 pounds. Dual height for use as a workbench. Standard Equipment - Four Swivel Pegs. Specialized One-Handed clamp handle. Rubber feet. SPECIFICATIONS: Bench Height 31-1/8". Parallel Clamping 0 - 8-5/16", Parallel Peg Clamping 0 - 18-3/4", Diagonal Peg Clamping 0 - 29-3/8". Work Surface 20-3/4" x 29-1/8". 16-gauge galvanized steel sawhorse with legs that lock into place and rubber feet to protect your floors; legs angle in two directions; spring-loaded locking pins; sold individually; must buy two to make a pair. Strong and tough; simple design for fast, easy set up; make sawhorse whatever length you want by using any 2X lumber; Lifetime Guarantee. Instant set up; portable all-in-one work table, clamping system and sawhorse; integrated clamping system holds materials straight, angled, combined, up, down and around; it holds materials so your hands are free to work; compact design for effortless transport and storage; built with organization and layout tools that make you more productive. For Vulcan 48" and 36" job boxes (SKU 770.9892). Includes "brake" function. Part of the PACKOUT? Modular Storage System; constructed with impact resistant polymers; 250lgbs. weight capacity; industrial grade extension handle; 9" all-terrain wheels; IP65 rated weather seal; metal reinforced corners; metal reinforced locking point; interior organizer tray; mounting location for the ONE-KEY? TICK?. Compatible with all "ToughSystem" modules; robust racking solution can load up to 440 lbs. Cost and space efficient; clear lid made of polycarbonate for resistance and full content visibility; includes 4 large and 8 small removable cups; stacking side latches allow attaching additional organizers or other "ToughSystem" modules; fits "ToughSystem" Metal Carrier DWST08210 and can be secured by its central locking mechanism. Includes "ToughSystem" Workshop Racking system amd "ToughSystem" Organizer (sku # 752.3277). Built-in organization compartments, convenient lift out carry tray. Clamping portable workstation; 37" clamping capacity with 2,200 lbs. of clamping force; foot operated clamping allows for both hands to control and position the work piece; 600 lbs. load capacity; all steel construction; tripod base for all-terrain stability; front roller for easy transport; folds quickly for compact transport and storage; stirrup feet allow for added stability. Solid steel, heavy-duty construction; unit is equipped with 118 of the most commonly used tools and accessories in custom formed tool specific organizers for ultimate storage and quick access; tool kit includes: Hex Key wrenches; 12 oz. Claw Hammer; 10' Measuring tape; 6" Long nose pliers; 9" Torpedo level; Twist drills; Masonry bits; Wood working drills; 8" Adjustable wrench; Screwdrivers; Magnetic Bit holder; Ratchet wrenches: 1/4", 3/8" and 1/2"; 3/8" Spark plug sockets; 2 Extension bars; Drive sockets: 1/4", 3/8" and 1/2"; Screwdriver bits: 25mm and 50mm; 18mm Zinc Alloy Knife; 10" Groove Joint pliers and 6" Lock Grip pliers; Ball bearings keep the drawers operating smoothly and minimizes wear and tear. Metal carrier with adjustable foldable brackets allows tailored configuration; central locking mechanism secures the boxes to the frame; "ToughSystem" cases not included. Weight capacity: Brackets - 176 lbs., Tote plate - 265 lbs., use on stairs - 175 lbs. ; Dimension: 26" L x 37" H x 9" W.
Easy lift extended edge lid. Tall, deep handle recesses. Bolt cutter free locking system protects padlocks inside 12 gauge steel housings from cutting tools and pry bars. Padlocks (not included) cannot be pried or pulled out. Heavy-duty hinge is staked and welded to prevent the hinge pin from being driven out to break in. Heavy-duty 1" steel locking arm holds the lid open. Easy access 3-3/8" tall caster bolsters for adding optional casters (not included). Easy lift extended edge lid. Tall, deep handle recesses. Bolt cutter free locking system protects padlocks inside 12 gauge steel housings from cutting tools and pry bars. Padlocks (not included) cannot be pried or pulled out. Heavy-duty hinge is staked and welded to prevent the hinge pin from being driven out to break in. Heavy-duty 1" steel locking arm holds the lid open. Easy access 3-3/8" tall caster bolsters for adding optional casters (not included). Integrated power and USB on chest can charge power tools, batteries and electronics. 18-20 gauge double-wall steel construction is reinforced with internal corner gussets. 100 pound ball-bearing drawers with soft close latching for smooth and quiet operation. Under-lid area includes an open front, gas struts and top mat. Dewalt? labeled lid stiffener provides extra stability. Heavy-duty keyed locking system safeguards your tools. 12,348 cubic inches of storage. Heavy duty drawer slides with 100 lb capacity; thicker gauge steel body for increased durability; 10-3/8" deep top lid provides enough space to stand up "Dewalt" cordless power tools; auto return drawers keep drawers securely closed while maneuvering around work site; 18" drawer depth and heavy duty casters. Easy lift extended edge lid. Tall, deep handle recesses. Bolt cutter free locking system protects padlocks inside 12 gauge steel housings from cutting tools and pry bars. Padlocks (not included) cannot be pried or pulled out. Heavy-duty hinge is staked and welded to prevent the hinge pin from being driven out to break in. Heavy-duty 1" steel locking arm holds the lid open. Easy access 3-3/8" tall caster bolsters for adding optional casters (not included). Solid 16 gauge steel 48" and 36" boxes. 20 gauge steel 30" box. MIG welded seams for extra durability. Tamper proof locks keep tools safe. Recessed industrial strength handles. Heavy-duty locking hinge provides extra lid strength. Large and medium boxes are pre-drilled for casters (SKU 772.4156). Durable powder coat finish for rust-resistance and scratches. 48" - tool box: 48" L x 24" W x 27.5" D, volume: 18.4 cubic feet. 36" - tool box: 36" L x 17" W x 22" D, volume: 7.7 cubic feet. 30" - tool box: 30" L x 16.5" W x 11.9" D, volume: 3.4 cubic feet. Constructed of double-wall steel for strength and durability. Conveniently charge your power tools, batteries and electronics right from the side of the cabinet. It has nine 100-pound load capacity drawers with soft close latching for smooth and quiet operation. It also has a heavy-duty keyed internal locking system to safeguard tools. Has a load rating of 1,500 pounds with reinforced mounting channels and has four 5-inch x 2-inch casters, two of which lock and swivel. A full-grip tubular side handle with a comfortable black overmold is included for ease of mobility. Also included are nine Dewalt? embossed drawer liners and one Dewalt? embossed top mat to help protect the cabinet surface. Features: 3-point locking mechanism to protect from theft; reinforced 11-gauge vertical "ribs" provide additional strength and rigidity; reinforced hat for extra lid stiffiness; recessed lock housing to avoid lock cutting; 16 gauge steel body; 14 gauge steel floor; four-way skid access; 7 gauge steel skids; pre-drilled caster holes; powder coat finish provides industrial durability against harsh outdoor elements; recessed side handles; full length piano hinge, stacked and welded for security measures against break-ins; heavy-duty gas struts for controlled and easy lid opening/closing; rear rubber grommet for electrical pass-thru. Made in USA. Features: 3-point locking mechanism to protect from theft; reinforced 11-gauge vertical "ribs" provide additional strength and rigidity; reinforced hat for extra lid stiffiness; recessed lock housing to avoid lock cutting; 16 gauge steel body; 14 gauge steel floor; four-way skid access; 7 gauge steel skids; pre-drilled caster holes; powder coat finish provides industrial durability against harsh outdoor elements; recessed side handles; full length piano hinge, stacked and welded for security measures against break-ins; heavy-duty gas struts for controlled and easy lid opening/closing; rear rubber grommet for electrical pass-thru. Made in USA.